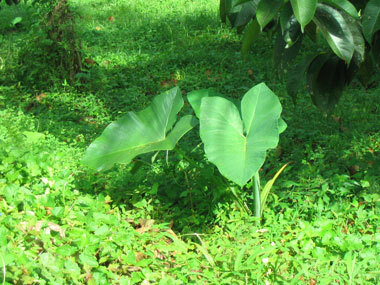 Tongan: Taro (Colocasia esculenta, Araceae). 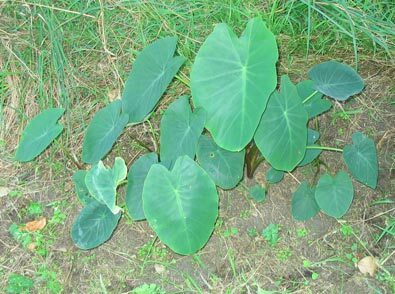 The word also has been adopted by Tongan from Samoan and other languages in the form of Talo, with qualifiers, to refer to other members of the aroid family, as with Talo hina, Xanthosoma sagittifolium, Talo lauila and Talo mangamea, Alocasia macrorrhizos. Niuean, Samoan : Talo (Colocasia esculenta, Araceae). 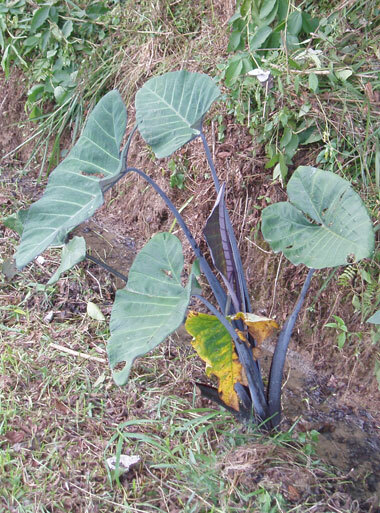 Marquesan: Ta'o (Colocasia esculenta, Araceae). Hawaiian: Kalo (Colocasia esculenta, Araceae). Rapanui, Tahitian, Tuamotuan: Taro (Colocasia esculenta, Araceae). 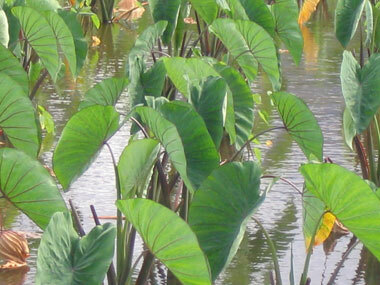 Rarotongan: Taro (Colocasia esculenta, Araceae); Taro taruā (Xanthostemma sagittifolium (araceae). Maori: Taro (Colocasia esculenta, Araceae). Arborlan Tagbanwa (Philippines): Talis (Colocasia esculenta, Araceae). Tomemboan Minhasa (Sulawesi, Indonesia): Tale (Colocasia esculenta, Araceae). Javanese (Indonesia): Tales (Colocasia esculenta, Araceae). Marovo (Solomon Islands): Talo (Colocasia esculenta, Araceae). Fijian: Dalo (Colocasia esculenta, Araceae). Maori: Pehu (a premium variety of harakeke; also varieties of kumara and taro, and a ball made of mashed taro). From PROTO TAHITIC *Pehu, a variety of Taro. Tupuaki (Austral Islands): Pehu (a Taro variety). Taro was an important staple food plant in Austronesia generally, although the reflexes of the Proto Malayo-Polynesian word reconstructed as *tales have fared better in some Indonesian languages rather than Philippine languages, and Eastern (rather than Western) Oceanic languages, than in the others, where they have been supplanted by local variants. Javanese has tales, for example, but Tagalog has gabi Nonetheless, the plant was an important staple food throughout the Philippines until the arrival of rice (probably between the fourteenth and sixteenth centuries AD). 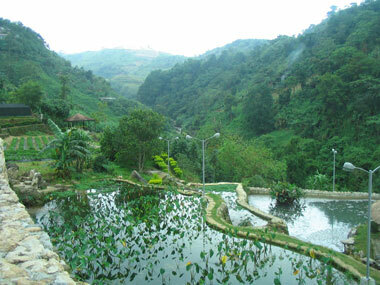 The famous and spectacular rice terraces of the northern Philippines probably were developed from taro ponds after rice was introduced in that region about 400 years ago. The Proto-Oceanic form, *talos, is strongly reflected in all Polynesian languages. 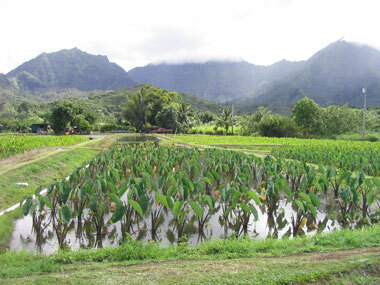 There are numerous cultivated varieties of taro, and many of these were carried throughout Polynesia and new ones selected and propagated over the centuries. Each established variety has its own name; the term *talo and its modern reflexes denote the species in general. The plant was brought to Aotearoa by the Polynesian settlers, and was widely cultivated. It required less care than the kumara, but was not as highly esteemed as that staple. In part that may have been because it simply didn't taste as good, as growing conditions in most districts would have been much less favourable than in the tropics, or perhaps varied in quality for other reasons. One of the scientists at the University of Hawaii's plant research centre in Kaua'i, which was responsible for saving many Hawaiian kalo (taro) varieties from extinction, told me that many years ago they had sampled two traditional Maori varieties which they had been given to add to their collection, and found them quite unpalatable no matter how they cooked them. While there were were recommented days for planting (Elsdon Best notes these as the 17th, 18th and 28th (Orongonui) days of the lunar cycle -- The Maori, Vol. 2, p. 392), and recommended methods, such as protecting from wind with brush screens (a procedure also adopted for kumara), neither the planting nor the harvest seems to have been attended by special rituals. Arrival in Aotearoa. Nonetheless, as noted in the next sections, the taro has a significant symbolic role in metaphor, proverbs, and Biblical translation. It was an important staple food in those places where it would grow, and is mentioned in several of the narratives of the early settlement of Aotearoa. Quite clearly, it was one of the "canoe plants", and its arrival and careful cultivation here, along with the hue (calabash gourd), uwhi (yam) and kūmara, provides strong evidence for the deliberate settlement of Aotearoa as part of the Polynesian expansion eastward in the early centuries of the second Milennium. Tainui traditions tell us that the taro was carried here by Hoturoa's sister Marama. When the Tainui canoe, captained by Hoturoa, arrived at Kawhia after visiting other points along the northern coast of Aotearoa, Hoturoa established a Whare Wānanga (School of Higher Learning), while his wife, Whakaotirangi, established the gardens. Disaffection arose when Hoturoa took a second wife, and Whakaotirangi with her sons left for the neighboring harbour, Aotea, where she established a flourishing kumara garden (which later Hoturoa came both to greatly admire, and bless with the appropriate pure rites to ensure its protection and success). 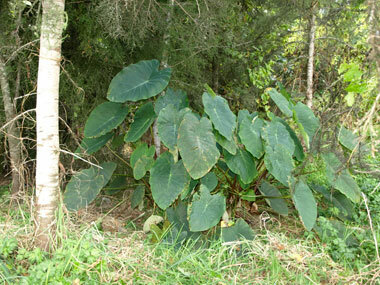 No mention is made of the taro in this second phase of the gardening narrative, but it is said that the same taro brought by Hoturoa continues to flourish at Kawhia to the present day. Further east, around the same time, a canoe named Nukutere arrived in the Bay of Plenty from Taranaki, bringing taro and karaka (Corynocarpus laevigata) seedlings, said to be from Hawaiki but probably from Te Taitokerau (since karaka is endemic to that region, and taro was established there at the beginning of Polynesian settlement). It is highly likely in fact that taro was part of the food and agricultural supplies brought to Aotearoa on all the major voyaging canoes whose crews and passengers were involved in the settlement of Aotearoa, and became established wherever conditions were favourable. It still survives unattended close to streams and rivers and other moist, frost-free environments in Taitokerau and other parts of the northern North Island. They also supplied him and his shipmates with pigs and wekas. Taro were also taken on board by whalers calling in for supplies in the Bay of Islands in the 1830s, with varying reports as to their quality compared with those acquired elsewhere. Traditionally, according to Elsdon Best, taro were planted in holes, termed whāwhārua, some deep and others shallow. Elsdon Best says that the deeper ones were termed ipurangi, a word that Williams (Dictionary, p. 79) says refers to the shallower pits, which Best calls pārua kōau -- a phrase also designating a pāua shell that was particularly deep, which gives us an idea of the way these holes were shaped. Williams refers to the deeper pits as whakarua kawau, perhaps because they were shaped like mini versions of a hole where a kawau (cormorant) might dive for fish. These planting holes were spaced about 60 cm apart. Gravel was placed in each pit, along with four taro roots. Varieties of taro. It seems that, as with the kumara, most of the old varieties of taro were replaced by new, better flavoured or stronger-growing ones in the course of the vigorous international trade in which the Māori engaged in the 1830s. However, many of the names were recorded, possibly two of which have cognates elsewhere in Polynesia. Only one of those, pongi, denotes a variety of taro in the other languages. The other, takatakapō (or takataka-a-pō), seems very doubtfully linked with the Proto Polynesian *takataka, but may be nonetheless as although the Samoan and Tongan cognates denote grass-like plants, the Fijian cognate denotes a climber with a fleshy root. 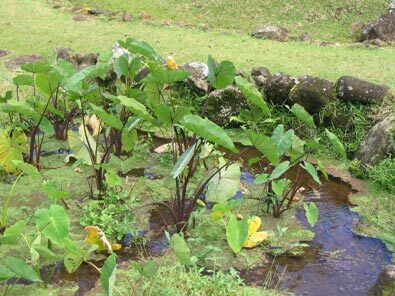 A close relative of the Fijian plant was given the name uhi "yam" (among others) in Hawaii, probably because its roots were eaten as a famine food (Wagner et al., Handbook, p.1610). It is just possible that a memory of this type of plant and its earlier name was carried to Aotearoa and transferred to a taro variety. As noted in the previous section, in Aotearoa the taro roots were planted in gravel four to a hole (some holes were deep and others shallow), in rows two feet apart. They were not specially irrigated. 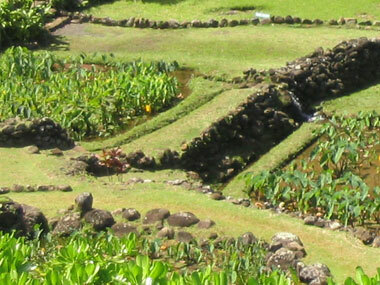 In Hawaii, the plants intended for food are usually grown on mounds in special fields flooded with water which is diverted from a nearby stream or river and allowed to flow through them during the growing season. Ornamental varieties are grown as garden plants. 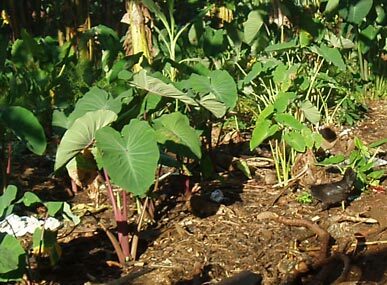 In Aotearoa cultivation of the taro declined markedly after the adoption of the potato, although some plants continued to grow wild in favourable situations, and a few families continued to cultivate them for their personal use. Peter Matthews notes that extensive taro plantations were in evidence in Northland and the East Coast of New Zealand in the early nineteenth century. It was also cultivated traditionally elsewhere in the North Island, and possibly also in some favourable environments in the South Island (On the Trail of the Taro, pp. 62-72). The government re-introduced taro to help avert starvation in Maori communities after World War I -- a Chinese variety was shipped to New Zealand via San Francisco, and widely grown in the North for some years, before once more being replaced by other crops. I was very disappointed to find out, when talking to a taro expert from Japan a few years ago, that the "Māori" taro I had been growing was in fact this Chinese variety. In addition to the taro cultivated for eating, there are a large number of widely cultivated ornamental varieties, often with red or purple leaves and stems. 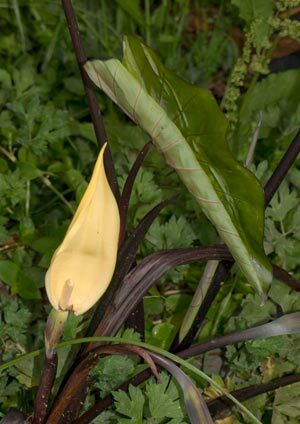 Taro rarely flowers in Aotearoa, but occasionally produces flowers very similar to those of the arum lily, to whch it is related. The photograph on the left is of an ornamental variety in flower in the Landsendt Garden, Oratia, Auckland in February 2019. 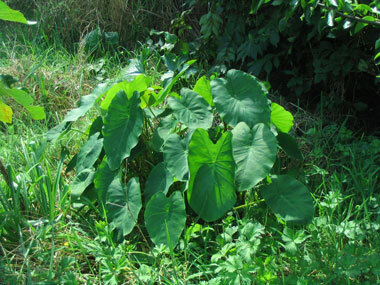 There is a taro-like plant from South America which was among the "galleon plants" brought into the Pacific by Spanish and Portugese navigators. This is Xanthosoma sagittifolium, found throught the Philippines and much of Southeast Asia, as well as the tropical Pacific Islands, in the form of green and purple cultivars. Both of these are illustrated in the gallery on this page. Neither of these are true taro, but they are loosely referred to by this word, usually followed by a descriptive term, in Tongan and some other Polynesian languages. One Tongan term is talo hina; others (some denoting different cultivars) are taro futuna, taro tea, taro kula and taro tofua. 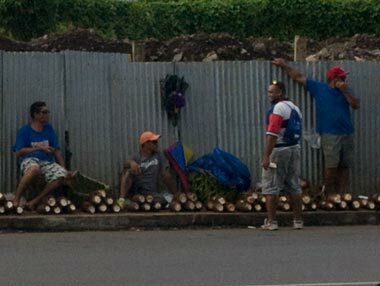 In East Futuna and Niue it is talo fiti, in Mele (Vanuatu) taro fījī, and in East Uvea talo fisi (all meaning "Fijian taro", where "Fijian" is probably a synonym for "exotic" or "foreign", as with talo palagi in Tokelau). 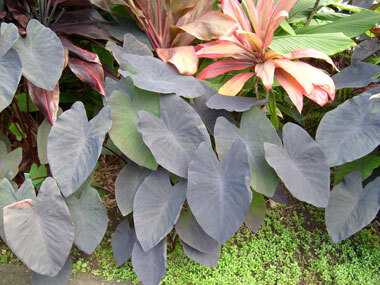 Like Colocasia esculenta, the Xanthosoma cultivars have edible leaves and tubers. kinakina - "an inferior variety" - maybe one of those sent to Hawaii? The others mentioned by Williams are: awanga (also the name of the southwest wind, and a variety of harakeke); hanina; haukopa; whakahekerangi; kauere (also the name of the tree Vitex lucens [puriri] and a plant and seaweed used for scenting oils); mamaku (also the name of the tree fern Cyathea medullaris); maori (also a kumara and a [post-1769] potato variety); makatiti ~ matatiti; paeangaanga; pātai; pehu (also a name for varieties of kumara and harakeke); pōtango (also a harakeke variety); tanae; tautaumahei; whakatauare; tokotokohau; turitaka; upokotiketike; wairuaārangi. Other taro-like plants, often referred to generically as "taro", but with distinctive names in the countries where they are cultivated, are the giant swamp taro Cyrtosperma merkusii (Araceae), and another taro-like aroid, Alocasia macrorrhizos, both of which are "canoe plants", carried into and through Polynesia from elsewhere in Oceania in the early stages of settlement. According to the notes to the poem, Kea is said to have been a god (or symbol of a god) brought on the Takitimu canoe, Taiporutu is a place in the Mahia district, and Whiringatau is said to have been the leader on board the Papahuakina canoe which landed at Nukutaurua, also near Mahia. Williams also notes the expression taro puia nui "many (or large) clumped taro" as a metaphor for a family with many scions. I ngaua iho nei, ē ī. (The loss) of whom gnaws on within.] (NM #149: 53-54. Kahutuatini was a chief of the opposing Ngati Maniapoto force, killed by Maene, a slave of the composer, Te Maropounamu. In another poem, however, taro is presented as something of lesser account. Hara of Tuhoe, in He waiata whakautu taunu (A rejoinder to a disparaging remark), ranks taro and yam as foods of minor importance when compared with fatty meat, in response to her being accused of being stingy with food. He aha te kai mauratia e ahau? Ka taka te piko o te whakairo. He mīmiha, he pakake rā. He nanua pounamu kai te moana rā. [What food was it I withheld? 'Twas only the uhi and the taro. For these the exquisite carving is defamed. With the mīmiha and whale meat. The notes by Elsdon Best explain "mīmiha" as whale, and "a black bituminous substance thrown up on the seashore" (the same definitions are given in Williams' dictionary), and the "glistening morsel" as the fatty portions of a fish known as "Hine-wehe". The song itself was composed after contact with foreigners (the reference to rum), but while both taro and yam (uhi) were still being cultivated. Although the phrase "nanua pounamu" does indeed normally refer to the red moki (Cheilodactylus spectabilis, Cheilodactylidae), the pairing with "te kai o te tipua" perhaps implies that the "glistening morsel" is the bottle in which the rum has been transported over the sea, rather than an esteemed deep-sea fish. Kia heke te kawakawa i te rae o te tangata ka kai ai ia i te taro. In other words, complete the ceremonies of mourning first, before tucking in to the food. Taro supplies were limited and taro was a special food, so women would count the guests before bringing out the taro from storage, so as to be hospitable but not wasteful of a precious resource. Whaitiri, the thunder goddess, after her return to the heavens from her life with her mortal husband was eventually encountered by the hero Tawhaki as he ascended to the celestial spheres; he found her in the form of a blind woman carefully counting out taro for her granddaughters -- hence the reference to taro as "ngā kai tatau a Whaitiri". In other words, a large tribe, or a large group of people committed to a common purpose, will not easily be thwarted. Taro in Te Paipera Tapu. The word "taro" appears over 400 times in Te Paipera Tapu, the Māori translation of the Bible, almost entirely where English translations refer to bread. In the Biblical translations quoted here, in addition to an English translation taken from the New Revised Standard Version (NRSV) along with the text from the 1958 edition of Te Paipera Tapu (PT), we have reproduced the same passages from a recent Samoan translation (TP) for comparison (for bibliographic details see the references at the end of this page). This is to illustrate the difference between the approach of the Māori translators compared with those translating the Bible into most other Polynesian languages, and in this case also of most standard English translations. Where the Māori translation generally employs the word that refers to a root crop which traditionally served as a staple food, the other translations either explicitly refer to a non-traditional grain-based baked product, or use a general term for food or eating that covers such a product. In cases like this the Samoan translation often substitutes the Samoan adaptation of a Greek or Hebrew word for an object for which there is no indigenous word (as do those in some other Polynesian languages). This is occasionally done in Māori translations, but the Māori translators often favour words for objects that will be familiar to Māori speakers as substitutes for precise, literal equivalents, or adaptations of the original term or its surrogate in another language. The equivalent English, Māori and Samoan words or phrases in the examples below are highlighted in bold type. The Māori text is sandwiched between the English and Samoan to make comparisons easier. Macrons, and also hamzas in Samoan, are used only where they are present in the publications from which the quotations are taken. In later versions of this page we may add macrons to the Māori text. PT: Kua whangaia mai e koe he roimata hei taro ma ratou, he nui hoki te mehua roimata kua homai nei e koe kia inumia e ratou. PT: Maka tau taro ki te mata o nga wai; kia maha hoki nga ra ka kitea ano e koe. TP: Ina lafo ia lau mea e ‘ai i luga o le vai; auā a mavae aso e tele e te toe maua. PT: Homai ki a matou aianei he taro ma matou mo tenei ra. TP: Ia e foai mai ia te i matou i le aso nei a matou mea e ‘ai e tatau ma le aso. PT: Ka whakahoki a Ihu ki a ia, ka mea, Kua oti te tuhituhi, E kore e ora te tangata i te taro kau. TP: Ona tali atu lea o Iesu ia te ia “Ua tusia, E le na mea e ‘ai, e ola ai le tagata”. PT: Na ka mea ia ki ana tamahine, A kei hea ia? He aha taua tangata i whakarerea ai e koutou? Karangatia ki te kai taro. PT: Na ka korerotia e raua nga meatanga i te ara, to raua mohiotanga hoki ki a ia i te whatwhatinga o te taro. TP: ... ina o tofitofi le areto. PT: Me tapae ano e ia, hei tapiri mo nga keke, etahi taro rewana, i runga ano i te patunga whakawhetai o ana whakahere mo te pai. TP: Na te avatua e faapāpā areto ua faafefeteina faatasi me ma lana taulaga; atoa ma le taulaga faaneenee o lana taulaga faafetai. PT: Whakahaua nga tama o Iharaira, mea atu ki a ratou, Kia mau ki taku whakahere, ki taku taro mo aku whakahere ahi, hei kakara reka ki ahau, kia tapaea mai ki ahau i tona wa ano. PT: Na ka whakahokia e ana akonga ki a ia, Me aha e te tangata ka makona ai enei i te taro i konei, i te koraha? TP: Ona tali mai lea o ona soo ia te ia, "Maifea e mafai ai se tasi ona fafaga te i latou i areto i lenei vao?" NRSV: He asked them, 'How many loaves do your have? They said, 'Seven'. PT: Ka ui ia ki a ratou, E hia a koutou taro? Ka mea ratou, E whitu. TP: Ona fesili atu lea o ia ia te i latou, "Pe fea ia ni a outou areto"? Ona latou fai mai lea, "E fitu." However, in the guise of unleavened bread, taro once more makes its appearance. PT: Na kia kai tatou i te hakari, auaka te rewana tawhito, auaka hoki te rewana o te mauahara, o te kino, engari hei te taro rewanakore o te tinihangakore, o te pono. TP: O lenei, aua tatou te faia le tausamiga ma le mea fafefete tuai, o le loto leaga ma le amio leaga; a ia faia ma le mea e le fafefeteina, o le loto lelei ma te faamaoni. In the Māori translations of scripture, taro has thus been given the literal meaning of "bread", as well as being used in contexts where "bread" is employed in a metaphorical or symbolic sense. Outside this particular religious context, however, in everyday spoken and written Māori taro refers exclusively to the root crop and plant brought originally from Hawaiki, while the word paraoa, adapted from English, signifies flour and the bread baked using this. In Samoan, areto is a word reserved for scriptural and liturgical use; everyday bread is falaoa, or falaoa vela ("cooked flour"). The way the word taro is employed in Biblical texts however indicates how vital this plant was for Māori well-being in the early years of contact with missionaries and Biblical scholars, despite the much greater attention paid to its companion canoe plant, the kumara. Further information : There is a wealth of information about Taro, in Aotearoa and internationally, in Peter Mathews' book On the Trail of Taro (Osaka: National Museum of Ethnology, 2014). An earlier article him, "Nga Taro o Aotearoa" in the Journal of the Polynesian Society (Vol. 94, No 3, 1985, pp. 253-272) is also available on-line. 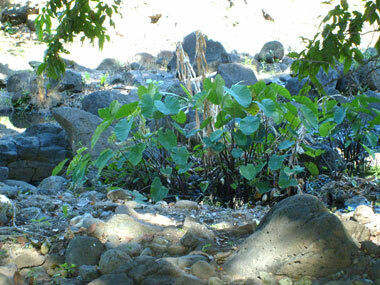 There was a Hawaiian account of the origin of taro on the "earthfoot" website, which underlined the importance of this plant in Hawaiian culture. However when we last checked the link, neither it nor the site itself were accessible. 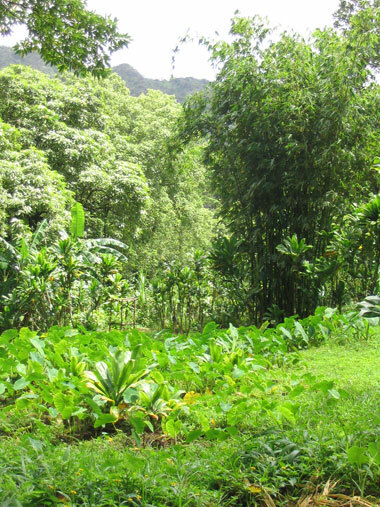 Hawaiian researchers John Cho and colleagues wrote a very interesting account of "Hawaiian Kalo, Past and Future" in the journal Sustainable Agriculture (February 2007). Te Ara / The Encyclopedia of New Zealand has a web page with some further references to the kumara in pre-19th century Maori life. Some traditional accounts of the introduction of taro can be found in Tainui, by Leslie G. Kelly, pp. 63-4; Edward Shortland's Traditions and Superstitions of the New Zealanders, p. 3; and Percy Smith's History and Traditions of the Taranaki Coast, pp. 63, 142-3; Elsdon Best has a highly informative section on the cultivation of taro, including a comprehensive list of varietal names, in his Maori Agriculture, pp. 233-243 (publication details of all these works will be found in the bibliography). The replacement of taro by rice as a staple in the Philippines is discussed in the publications by Stephen Acabado and associates, also listed in the bibliography. There is also a comprehensive discussion of the literary evidence for the introduction of taro into the Mediterranean from Asia, including the shift in meaning of the Greek word kolokasia (or kolokasion) from indicating the edible rhizome of the sacred lotus (Nelumbo mucifera, also an introduction from Asia) to referring more commonly, then exclusively to the taro (now known botanically as Colocasia esculenta) from around the fourth century A.D, in a recent paper by Ilaria Maria Grimaldi and colleagues, including Peter Matthews. 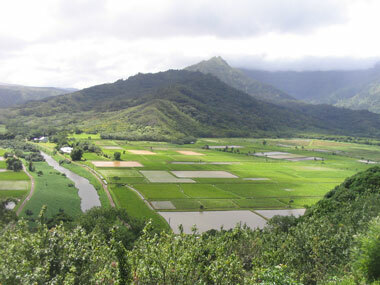 Taro plantations and mangroves perform similar functions in trapping fine sediments and thus mitigating the effects of erosion on waterways and shorelines (see the paper by Shirley Koshiba and others in the bibliography). In New Zealand, Aroon Parshotam has also done important research on the growing and uses of taro. Further useful information can also be found in the University of Hawai'is College of Tropical Agriculture's background paper on taro research. Full publication details are in the bibliography. Biblical Texts: In the Biblical citations, the English texts have been taken from the 1989 New Revised Standard Version as presented in the Poverty and Justice Bible, 2015, the Maori Text from Te Paipera Tapu, 1958 Edition, and the Samoan text from O Le Tusi Paia, 1969 edition. Full publication details are in the bibliography.